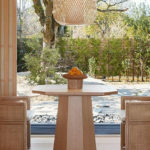 The newest addition to the Aman Resorts constellation, Amanemu embraces the ancient Japanese bathing tradition of onsen, using nutrient-rich thermal springs to provide a contemplative and restorative retreat set among serene natural surroundings. 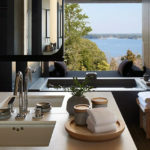 Perched on the rolling hills of Ise-Shima National Park in southwestern Japan, Amanemu is a hot-spring sanctuary overlooking the calm waters of Ago Bay. The area around the resort is very rural, quite mountainous and the road to get there passes by lakes and the sea. The coast is quite rugged and the views are good. 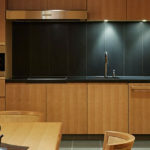 The overall impression is of a very high level luxury chalet style resort with no expense spared in design or comfort. 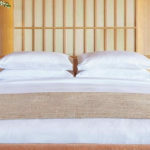 There are twenty-four Suites and four two-bedroom Villas, all of which feature an expansive deck and a private onsen. 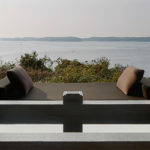 Nestled within the landscape with scenic views out to the bay or gardens, the Suites are abound in elegant simplicity. Each of the 24 Suites measure 99 square metres (1,065 square feet) and feature a private onsen. Generous terraces provide maximum enjoyment of the natural surroundings in all seasons. With a light-filled atmosphere and emphasis on natural materials and soothing hues, Amanemu’s Villas each feature two bedrooms spread across 375 square metres (4,036 square feet). 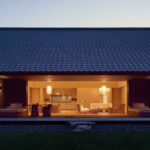 Woven textile shutters can be opened to embrace the outdoors, and each Villa features a private onsen, kitchen and powder room.